Delta, or incremental indexing, is pretty much the main reason I am so excited about Nutch/GORA. Replacing segment files with database opens up the possibility of external programs modifying metadata in the database, and thereby modifying the pipeline's behavior to support delta indexing. For web crawling (Nutch's default use case), the Adaptive Fetch Schedule is an excellent choice. This component (set by db.fetch.schedule.class) will decrease or increase the fetch interval based on whether the page has changed or not. However, if you wanted to use Nutch as an indexing pipeline for a Content Management System (CMS) for example, then you will need to offer the CMS folks a slightly more deterministic way to control what appears in the index. When a CMS publishes a piece of content, the content should (within some predictable time interval) make it into the index (so it starts appearing in search results). On the other hand, when a CMS unpublishes a piece of content, it should disappear from the index. In this post, I propose an approach that does this, using Nutch/GORA (with custom plugins) and some supporting infrastructure. As I mentioned earlier, the CMS can send either a publish or an unpublish request. A publish request can translate to an Add (if its a new page that doesn't exist in the database) or an Update. An unpublish request would translate to a Delete (or Hide) request at the database level. For an Add request, we reset the fetch time of the provider page to the current time minus the fetch interval, making it eligible for a fetch in the next crawl run. Since it is dynamically generated off the file system, the added file is guaranteed to be in this file (since it exists in the filesystem). In the first iteration of the recrawl, the index page will be refetched and reparsed, and the second iteration will generate the newly added page(s) from the index page outlinks to the fetch list, and then to the index. Of course, the index page itself should not make it into the index, so we have a custom Index Filter (described later) to filter these out by pattern. Here is an alternative approach which relies on accurate Last-Modified headers and a more aggressive crawl schedule. With this approach, you don't need an index file or any custom handling for Adds and Updates, but you do need to crawl more frequently. I prefer an event based approach, which is what I have here. For an Update request, we reset the fetch time of the page specified by the URL, similar to the index page. The first iteration of the next recrawl will pick the changes up and update it into the index. For a Delete, we do two things - first, we delete the record from Solr. Then we mark the record deleted in Cassandra by setting the status to STATUS_GONE. We add logic to an indexing filter to filter out pages with this status from making it into the index. To do the publish and unpublish on the index, I built a tool (callable using full class name from bin/nutch). For this I built my package under nutch's src/java tree. I had to modify the nutch build.xml slightly to get my code to compile, specifically add the com/mycompany/nutch/**/*.java path to the javac includes in the "compile-core" target of nutch's build.xml. I had initially planned on building it with GORA so it could be easily translated to other backends as well. The GORA tutorial has examples of retrieving and updating records by key. However, it turns out that the CassandraStore (the gora-cassandra implementation of the DataStore), has an empty implementation of get(String) that returns null. 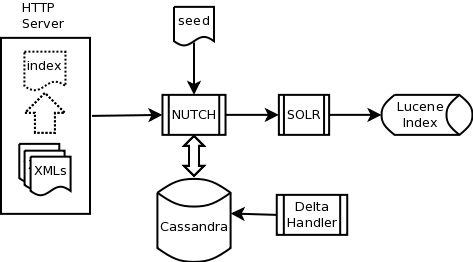 So I finally settled on using the Hector API (which GORA also uses) to talk directly with the Cassandra database. I am using Hector's template API which feels similar to (and is probably inspired by) Spring's JdbcTemplate. Here is the code for this tool. Not as nice as using GORA (ie not database agnostic), but it'll have to do for now. This is really only for testing. For high volume use, it would be fairly simple to have this logic live behind a webservice which the CMS code could call. But in any case, here are examples of command line usage of the tool above. I also added a few new properties for this tool (and for the plugin decribed below). Here are the additional properties from my nutch-site.xml file. As mentioned above, you probably don't want your index pages to make it into the index, since they are basically link farms and have no useful content (for the search user). So you want to suppress these pages from ever making it into the index. The second class of pages would be the ones marked GONE by the unpublish command. The unpublish deletes the record from the Solr index, but you want to make sure that the page doesn't slip in on the next solrindex call. So we build an indexing filter which filters out these two category of pages. The functionality above is built into the DeltaIndexFilter, a simple Nutch IndexFilter implementation. Here is the declaration for this filter from my plugin.xml file. name="Delta Indexing related Page Index Suppressor"
and here is the code for the DeltaIndexFilter. And thats pretty much it! 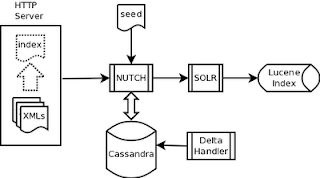 Delta indexing in just a few lines of code (relatively speaking of course - this is Java we are talking about :-)), thanks to Nutch/GORA (which gives us the Cassandra database) and Hector (which gives us the API to write to it from outside Nutch). Update - 2012-02-04: I managed to figure out how to implement the CassandraStore.get() method, so my DeltaHandler code does not have any (direct) Hector calls anymore, here it is. * page corresponding to the idx is reset, so it is recrawled. * @param url the URL to publish. * @param idx the value of the u_idx metadata. * record from SOLR, then marks the record as GONE in database. * @param url the URL to unpublish. * @param idx the value of the u_idx parameter. The patch for CassandraStore.get() is available at GORA-93. Since it is applied against GORA 0.2-incubating, you will also need to patch your NutchGora branch with the patch from NUTCH-1205. Note that the reason why neither patch is applied at the moment is because of some failing unit tests traceable to the gora-sql module. The patches worked fine for me, but I am using only gora-cassandra, so YMMV. I am working on nutch and your blog posts are really helpful But i have some different problem. I want to crawl a particular site and fetch meta tags and other tags from html doc which are crawled and then store the URL->meta data in a mysql database. Can you please tell me how should i approach to solve this problem. Since i am new So dont know much stuff.And I have successfully crawled the site. Hi Lina, if you are using Nutch, you could write a custom parsing plugin that parses the contents of the page to produce the meta tags and write out the (URL=>metatag) mappings to a MySQL database (in addition to writing out the parse segments). This is inline with your normal nutch crawl. If you are using Nutch/GORA you can also do this offline by running a MR job against your datastore to retrieve the URL and content, extract out the (URL+metatag,metadata) in the map phase, and write these out to the MySQL database in the reduce phase. If not using Nutch/GORA then you can use the parse segments as input as well. This would probably be your preferred approach since you have already finished crawling the site.